Here is another cryptolist family of weather words to decipher. To solve this crypto-family of words, start with substituting the letter |B| with the letter |T|. 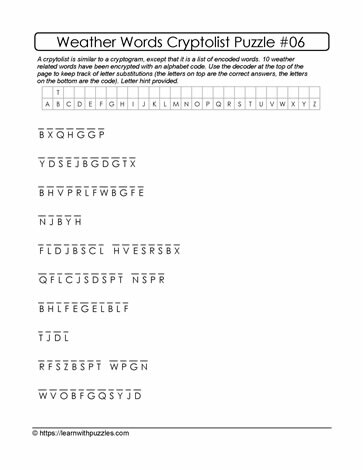 Next, review the encrypted letter patterns and use knowledge of weather related words, letter patterns and word structure/patterns to identify one of the words. Then, use the known letters from that identified word to decrypt other words in the family. Puzzles like these cryptolist family of words activate a number of problem solving strategies, stimulate the brain, consolidate spelling, and help improve brain health.